FORMER ANGLO IRISH Bank chief executive David Drumm has lost a bid to relax his bail conditions, with a judge ruling it is “not unreasonable” that he should sign on at a garda station every day. Drumm appeared before Dublin Circuit Criminal Court today, where his solicitor applied to reduce his signing-on conditions to once a week instead of once daily. Drumm (49), with an address in Skerries, Co Dublin, has been charged with 33 counts under two separate bills concerning alleged offences committed at the now-defunct bank. He has yet to enter a plea to the charges. He is facing two trials – the first has been set down for April next year and the second is due to take place in January 2018. The court heard Drumm is currently required to sign on daily at Balbriggan Garda station as part of his bail conditions. His solicitor, Aoife Corridan, told the court this takes about an hour every day, which she said was a “significant burden”. Corridan requested that Drumm instead be allowed to sign on once a week. 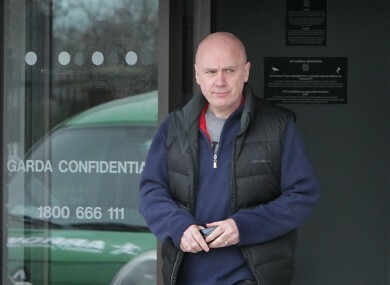 Prosecution barrister Sinead McGrath, BL, said Drumm’s signing-on conditions had already been relaxed from twice daily to once daily after his last court appearance in April. She noted that the court previously heard submissions that he posed a “serious flight risk”. Judge Martin Nolan noted that it was unlikely that Drumm could leave the state “without somebody noticing”. “Mr Drumm is one of the best known Irish men in this state,” he said. However, he said gardaí requirements that Mr Drumm sign on daily were “not unreasonable at this particular time and in this particular case” and he denied the application. Drumm is facing two charges of conspiring to defraud depositors and investors at Anglo by “dishonestly” creating the impression that deposits in 2008 were €7.2 billion larger than they were. He faces one additional charge in relation to the EU transparency directive. He will stand trial for those offences on 24 April, 2017. The case is expected to take 12 weeks. Drumm also faces 16 counts of offering unlawful financial assistance to members of businessman Sean Quinn’s family and 10 other individuals as well as 14 charges of falsifying documents. These charges will be dealt with at a trial set down for January 12, 2018. That trial is expected to last about two months. Comments are closed as legal proceedings are active. Email “Judge says it's 'not unreasonable' for David Drumm to sign on at garda station every day”. Feedback on “Judge says it's 'not unreasonable' for David Drumm to sign on at garda station every day”.